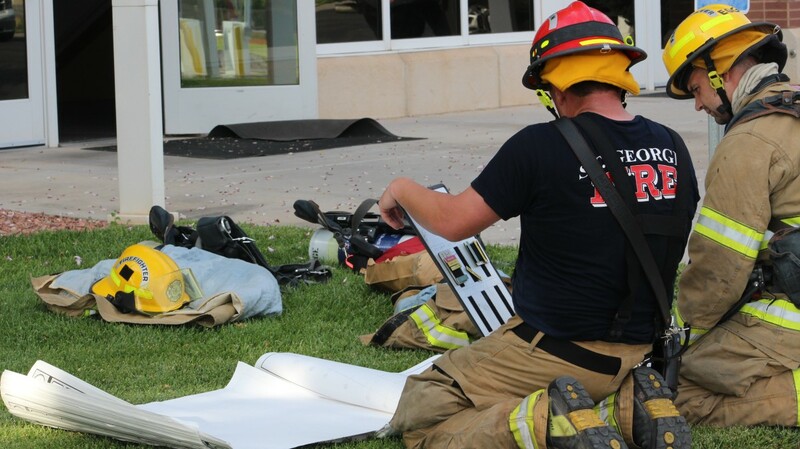 ST. GEORGE – What was first thought to be a fire at the LDS Institute building at Dixie State University Friday turned out to be a false alarm, but crews still had a wet mess on their hands. Around 5:30 p.m., the St. George Fire Department was dispatched to The Church of Jesus Christ of Latter-day Saints Institute of Religion at 943 E. 400 South to investigate a fire alarm. Specifically, they were alerted that water sensors in the sprinkler system were registering water flow, a sign that a potential fire had triggered the system. When firefighters arrived on scene, they couldn’t see any signs of water flow from outside the building, St. George Fire Capt. Brad Esplin said. After having to wait a few minutes for someone with a key to the building to let them in, Esplin said they observed water on the first floor seeping down from ceiling tiles. The water was flowing from a broken gasket in the attic and was shut off once firefighters concluded there was no fire on the premise. After that, the fire crews entered clean-up mode, Esplin said. Water damage to the building overall appeared to be minimal, Esplin said, though the water had seeped into carpets and the floor of the building’s basketball court.